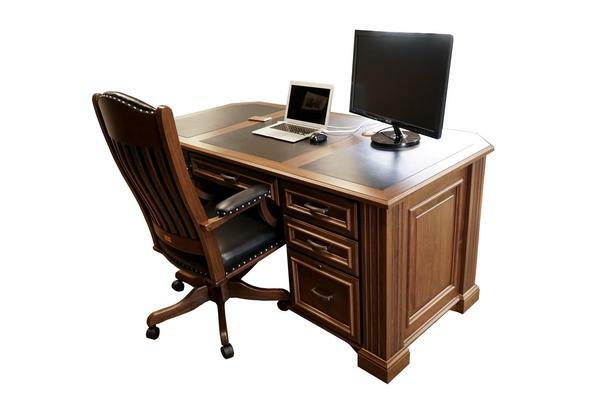 Our Amish Lincoln Executive Desk provides the ideal work surface and storage space for your home office or business. An executive desk commands the room, and the premium solid hardwood of your choice will be on display. Providing style and ultimate function, this solid wood executive desk is ready to support a productive workday. Executive desks are built to impress, often displaying intricate carvings, raised panels, and customized options like leather desktop inlays. All of our custom made Amish furniture is built to support your lifestyle in an efficient and stylish manner. This heirloom desk is made to stand the test of time and to be passed on to future generations. Be sure to visit our helpful blog post, "8 Office Desks That'll Get Your Job Done," for a complete guide to desk styles and their functions. Consider the Lincoln Healthier Living Stand Up Desk for another option. Call one of our Amish Furniture Specialists today at 1-866-272-6773 with any questions or visit the DutchCrafters showroom in Sarasota, Florida to experience our solid wood furniture in person. Note: Shown in a solid surface inset top but this desk comes with a hardwood top unless another option is selected. Because of the nature of Brown Maple expect color variations in the stain.